Sierra came across this recipe years ago. It's a fun project to do with kids. They help choose the colors, mix the rice, and bake it. Then it's glue sticks and messes! I have also used this with salt and sugar and it works great. 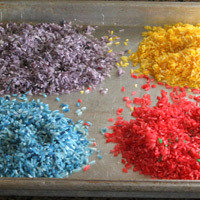 The sugar is especially useful for making your own sprinkles for cupcakes and cookies. You can get the exact color you want without paying $4 a canister. 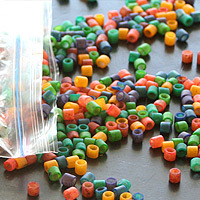 One more fun use is dying pasta to make necklace beads. One bag of pasta makes dozens of necklaces. I made some years ago and the color is just as bright as it was the day I made it. Preheat the oven to 250. Set out four bowls. Add 5 drops (1/8 t) and 1/2 t vinegar to each bowl. Mix to combine. Add 1/2 c rice to the first bowl, mix immediately and well. Repeat with the remaining colors. 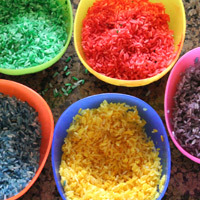 If it is not mixed right away, the rice at the bottom will soak up all of the dye. 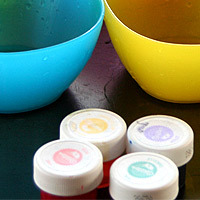 If it is mixed immediately, it will evenly coat each piece. Follow rice glitter instructions, using small pasta in place of the rice. Tightly wrap a small piece of duct tape to the end of a piece of yarn. 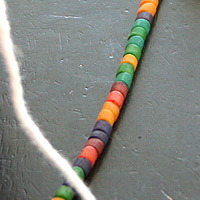 String pasta beads! 1. Preheat the oven to 250. Set out four bowls. 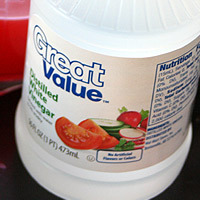 Add 5 drops (1/8 t) and 1/2 t vinegar to each bowl. Mix to combine. Add 1/2 c rice to the first bowl, mix (1)immediately and well. Repeat with the remaining colors. 2. On a large rimmed baking sheet, add the rice mixtures in seperate piles. Gently spread without mixing colors. Bake for 40 minutes. Cool completely. Transfer to seperate containers for use and storage. 1. 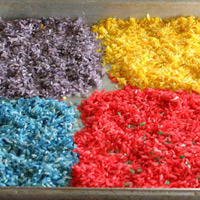 If it is not mixed right away, the rice at the bottom will soak up all of the dye. 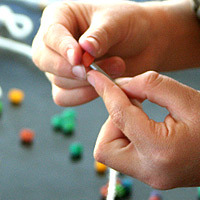 If it's mixed immediately, it will evenly coat each piece.